There is a recent TiVo addiction going on in this household, and it's definitely not helping me stay on track with WW. By the way, I meant to mention, I have mentally and physically fallen off the WW wagon over the last 5-6 weeks, but I am trying to get back on the program for the next few weeks to see if I can reach goal ..... ugh it's a tough cycle. This addiciton is all about food and splurging and travel, and often also about lots and lots of adult beverages while experiencing said food and travel. It's Mr. Anthony Bourdain himself, and he knows how to party worldwide. And he is sucking me in with every single episode I watch. I don't know why I never watched his show No Reservations previously. It's been on for years, but only now, as he enters his new season, have I gotten roped in and can't stop recording it. I have caught up on probably half of his all-time episodes, and the new ones just keep coming. I don't care if he's in Seoul or South Boston -- I love his wittiness, his crassness and his sarcasm. Only he can look at the camera and break the so-called fourth wall without saying a word, and only he can go day in and day out downing drink after drink without losing a step (by the way, obviously it's not that healthy for him, but it's quite funny to watch him out on a sailboat the night after yet another bender). Mostly though, I love the way he phrases his observations of the everyday sights, sounds and smells around him in each new city. He narrates the show as if it were his book (just starting to read it, loving it already), with extended metaphors literally dripping with emotion on every breath. I am visually and audibly eating it up. And then I want to go literally eat something after watching him devour all those fantastically foreign meals. 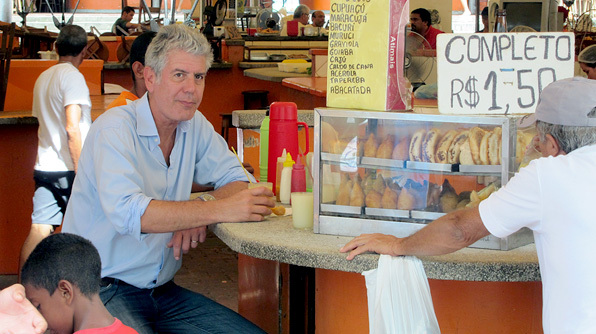 Are you a Bourdain addict? What cooking or travel show is your weakness? I tivo all his episodes and am reading his first book, "Kitchen Confidential." It's amazing!